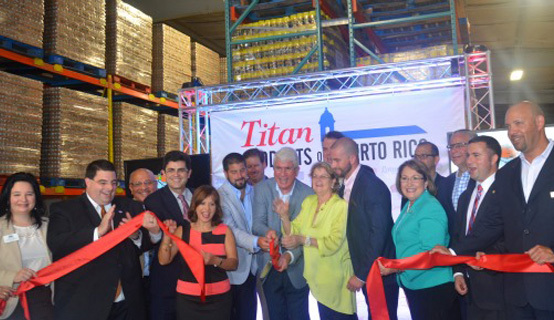 Orange County Mayor Teresa Jacobs recently participated in the ribbon cutting ceremony to officially welcome the new Titán Products of Puerto Rico distribution center in Orange County. The 40,000-square-foot facility, located at 1111 Central Florida Parkway, is now serving supermarkets, restaurants and stores throughout Florida with more than 200 products, including frozen foods, grains, and non-perishable goods. Titán Products of Puerto Rico is a subsidiary of Empresas Barsan, a Puerto Rico-based and family-owned company founded 31 years ago by Vicente Sanchez. His family’s dream of owning a business came true after years of hard work and determination. Empresas Barsan started in 1983 after the Sanchez family left Cuba for Puerto Rico in search of a better life and business opportunities. Titán Products of Puerto Rico started as a small manufacturer that produced frozen pastries and empanadas. The company is now one of the largest food distributors in Puerto Rico, serving stores in Florida and the Dominican Republic. Titán Products of Puerto Rico carries brands that include La Aguadillana Products, Puerto Rico Coffee Roasters, Arroz D’Aquí, Procesadora Campofresco, Apiarios Caraballo, Doctor Mecánico, Caribbean Nature Products, Jugos del Centro, Ferdi Ram Cheeses, Los Cidrines Bakery, Indulac, Carmela Foods, Chef Piñeiro and Titan Products. The Interstate-4 corridor is home to close to 600,000 Puerto Ricans, according to the U.S. Census Bureau. Titán Products of Puerto Rico will employ a dozen local citizens at the new distribution center. “This opening means more economic development in our community and attests to the vitality of our current business environment. We look forward to welcoming many more business partners from Puerto Rico interested in growing here,” Jacobs said. A variety of photos from the event is available for use by the media and are located on Flickr.